I went to a wedding exhibition after a really long time. The one thing that instantly hit me when I walked in at Wedding Asia Delhi 2017 was the breath of fresh new designs everywhere. It reminded me of exactly why wedding exhibitions are such a hit every single time. It does help to be at one of the best bridal exhibitions out there. Wedding Asia this time around had fabulous stalls having everything from bridal lehengas, anarkalis, kurtis and a whole lot of modern contemporary cocktail gowns. This was not my first time at Wedding Asia. I had been there last year, and it was a fabulous exhibition then as well. Last year, the one thing that stood out for me was the bridal lehengas on display, however this time I almost felt the theme was cocktail sangeet night outfits for todays modern bride. Evening gowns in the true sense, designers displayed a lot of solid monotone colours with minimal embellishments giving the outfits a stunning royal look. I can just go on and on about my favourites at the exhibition, but lets take a look at some of the stall and designer names that you must bookmark. This was one of the most paisa vasool stall at Wedding Asia. A one stop shop for all bridal party needs, you could find lehengas starting from 5000 bucks all the way to 2 lakhs displayed in the same stall. From evening gowns, to fusion cocktail outfits, bridal wear and casual ethnic wear, Surya sarees pretty much had everything available. Surya Sarees is primarily a wholesaler because of which they are able to provide the rock bottom prices for Lehengas. But now, they have also got into retailing. There store apparently is spread across 10,000 sq ft area of just bridal wear. So, you know you will find something to your liking at this place. 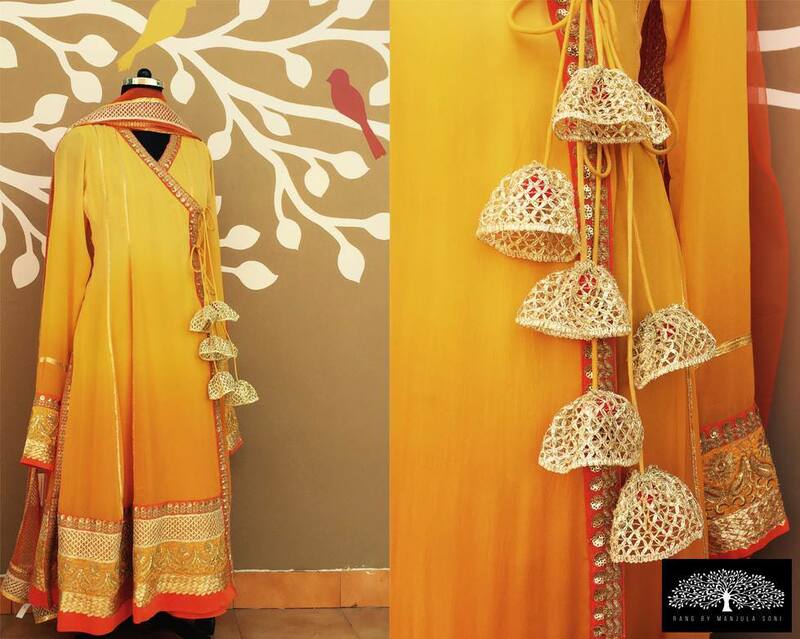 Tanya Hooda’s collection at the stall was one of the most colourful ones at the exhibition. The lehengas on display were perfect summer wedding outfits for any day functions like mehendi, haldi or any smaller prewedding functions. I loved the colourful Jaipuri printed lehengas in orange, pinks, and purples. They were really eye catchy in a good way. There were so many things about this stall that was drool worthy. Starting with the stall decor to the model wearing a gorgeous mustard evening gown, everything was just regal in a big way. Azalea is not a new name, I have reviewed them previously as well, and time and again the collections by Aditi Gupta have always been stellar. The brand is perfect for all brides looking for a fusion evening gown for their cocktail/sangeet night. Long trails, off shoulders with gold embellishments in bold colours, her outfits were bold and beautiful. The collection was aimed at contemporary looks for the modern bride. Price Range: Basic jumpsuits start upwards 18k whereas wedding attires start from 65k upwards. There are some stalls which from far you know you are going to visit, no matter how crowded it is. Rang by Manjula Soni was one such stall. Beautiful sorbet coloured lehengas and kurtas and anarkalis with beautiful heavy borders, her stall was mango meetha for me. Absolutely stunning lehengas for a decently good price. You know you’re getting your money’s worth when you see her outfits for the price. You might be a bride with your eyes set on that designer lehenga for your main functions. But it is the smaller functions which are the real deal. There are so many events that one has to attend both during the wedding and post marriage, that outfits such as these fit perfectly in no matter what the season. I loved that the outfits were simple yet elegant which could be reused on multiple occasions. If you are someone who loves lighter shade outfits, and mild bright colours then Manjula Soni outfits are the perfect pick for you. Price Range: Lehengas were in the range of 30k. Kurtas and anarkalis were int he range of 15-20k. One of my favourites at Wedding Asia 2017, her collection had beautiful evening wear which in one glance you would fall in love. I especially loved a navy blue gown with with big floral embellishments, it was breathtakingly gorgeous. The stall had everything from crop top lehengas to cocktail gowns, fusions sarees with jackets and more. None of the outfits were too over the top with heavy work, it was simple yet dramatic because of the dark colours. Price Range: The red gown above was around 18k, but generally outfits were in the range of 25k upwards. The one outfit that drew me to this stall was the beautiful bottle green evening gown. I loved the ruffles and the simple design. Looked so elegant yet the colour had that hatke magic to it. The designer had quite a versatile collection from cocktail outfits to more traditional lehengas. The fabrics used were flown silhouettes to net with sequins work and more. Her outfits had a lot of different kind of cuts. Nothing was ordinary about her style. Yet, there was something glamorous about it. You could pick up a fusion saree which has a figure flattering shape, or could pick up different evening gowns with various modern cuts. The looks were very fashion week like. Seen those mother daughter matching outfits in weddings? Want one of those custom made for you and your daughter? Then Tarun Vikas is the designer to go to. Some serious cuteness overload, his matching mother-daughter outfits were superbly adorable. But that’s not all that there is in Bespoke. Along with matching outfits, you can also get matching clutches, wedding shoes, and chokers and wrist bands of the same fabric and design of your outfit. The stall had a very english vibe to it, with the focus on evening gowns, very western in their looks. Price Range: Kids outfits start upward 9.5k, whereas cocktail gowns start in the range of 70k-1.2lakhs. If you are a bride to be looking for bridal lehengas in the price range of 25-35k, there is no better store than the pink mirror. Its a bridal paradise for all budget brides to be. I had visited the brands stall last year at Wedding Asia, back then as well, the brand really struck a chord with me. Anybody who asks me where to shop for bridal wear in Kolkata, this is the place I highly recommend.